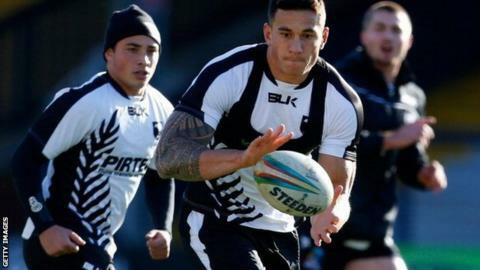 New Zealand's Sonny Bill Williams has been named player of the year by the Rugby League International Federation. The 28-year-old forward, the first Kiwi to win the award, beat Australia's Greg Inglis and Scotland's Danny Brough to the title. Williams only returned to the sport at the turn of the year after a five-year spell in rugby union and boxing. He has been a key member of the Kiwi side which will attempt to defend their World Cup title on Saturday. New Zealand, who beat England 20-18 in the semi-finals, play Australia at Old Trafford (kick-off 14:30 GMT). Williams, Inglis and Brough were all named in the 2013 international team of the year, a side selected on performances at club and international level between October 2012 and November 2013. The team also included England front rower Sam Burgess, whose younger brother George was named rookie of the year. Sydney Roosters' Trent Robinson was named coach of the year ahead of Wigan Warriors' Shaun Wane and South Sydney's Michael Maguire.